The Big Felafel has managed to obtain President Bush’s tentative schedule for his visit this coming week to Israel. While his plans may change make sure to check into The Big Felafel for all the latest news on Bushy Bush’s visit in the Homeland. Remember that although Bush has been preaching the Road Map during his very long Presidential term, this is his first visit to Israel. Apparently he thought that the Israeli-Palestinian conflict was an interactive television show where viewers try to help the contestants- Olmert and Abu Mazen- get out of “trouble. After Conda-poo-poo’s last visit she informed Bush that she was indeed in a real foreign land that does exist. She insisted that he visit to see the real “trouble” occurring in the region. Apparently Bush was shocked to here that this was not just another ABC series like “Lost” and immediately told Conda-poo-poo to plan his trip to the foreign land so that he may meet the real contestants- he meant people. 8:00am: Arrives and is welcomed by Soldiers and the Palestinian Authority Police Officers. Two of the officers are the terrorists from last weeks shooting in Hebron. He will award them the gold medal of honor in a ceremony that Prime Minister Olmert has set up to show some more “Good Faith.” Abu Mazen is upset that he isn’t getting anything since he helped plan it and freed them. 9:00am: Off to Gaza where he will dig his own tunnel, retrieve weapons through the Egyptian border, set up Kassam launchers with fellow terrorists and even have a chance to fire one or two from the former homes of Gush Katif residents. 11:00am: To the other side, Bush will end up in Sderot where he will meet with Kassam rocket victims, families affected by the rockets and the Mayor who hasn’t slept in months. He has been invited to a family’s home that no longer has a roof thanks to rocket fire. Then he will experience an hour of rocket fire throughout the city. They have told Bush he will be playing hide and seek, for Sderot this means after you hear the red alert you have about 15 seconds to find shelter- good luck! 1:00pm: Beach party- Time for Bush to hang out with some hot Israeli girls and Speedo wearing boys. A real Israeli b-b-q, playing in the sand and catching some waves. Who knows, a Katyusha might even land in his sand castle! 4:00pm: Time to head to Jerusalem and the Old City. Bush plans to ride a camel, buy a hooka in the Arab Shuk and eat one of those huge bagel things (he will probably ask for cream cheese). Then it is Press time. He will do photo ops both at the Wall and the Dome of the Rock. 6:00pm: Dinner with the boys. Bush, Olmert and Abu Mazen will have a private dinner at the Prime Minister’s House. I heard Bush has requested to roast marshmallows on the fire and tell ghost stories. 9:00am: Rise and shine its time to take an Israeli bus ride. Bush will ride a bus from the King David to the Knesset. The bus might have suicide bombers on it. He has requested the bomb squad robot be with him during the ride. 10:00am Meet the ministers. Bush will sit in on a real Knesset meeting where the members will be in jeans and t-shirts. Bush will be confused but then feel right at home when they sit around and do nothing. He will be happy to see that all “democracies” work the same. 11:30am: Brunch break. Here he will have the chance to meet the rest of the government and eat a real Israeli salad. The government has spent NIS 60,000 of our tax money to make Bush’s face out of a big plate of hummus. What will they think of next? He will talk with the press about his late night meeting with Olmert and Abu Mazen the night before. 1:00pm: As I understand it, the high school teachers had originally planned to have Bush teach an English class but after discussing the curriculum over the phone, they felt he would not be able to properly teach if he did not know the difference between a noun and verb. Instead he will have the children teach him English grammar. 4:00am: Time to climb Masada like every other tourist. Bush will still be hung over at sunrise; I am sure it will remind him of his college days. Then they will take the tram back down and play in the dead sea. Bush wants us to remind him to by Laura some dead sea salts. 9:00am: Meet the Bedouins. Bush was suppose to sleep in a Bedouin tent but opted for Tel Aviv instead and promised “next time.” Instead he has made sure to meet the Bedouins and have some super strong coffee which he will need at that point. 10:00am: Time for some relaxation. Bush will head to Eilat to scuba dive and ride a banana boat. He said he was so excited to ride the boat since bananas are his favorite vegetable. Naturally he will take his private jet to Eilat. 3:00pm: Meet the soldiers. 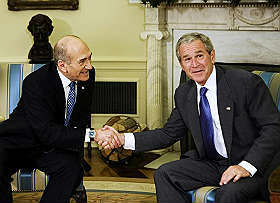 Bush will meet with soldiers from the Second Lebanon War and invite them to participate in the Iraq war since he does not have enough American soldiers and other country’s keep pulling out. 4:00pm: Meet Hamas and Fatah. Back over to Gaza. Bush plans to meet up with Hamas leaders and take part in the filming of a potential suicide bomber. He said he was always curious where there studios are and asked if he could make a film of his own as a souvenir. He will then meet with Fatah at Arafat’s grave and shoot guns in the air to mourn his death. 6:00pm: The plan is to meet up with Olmert and Abu Mazen in his hotel room to plan the next step of the road map. But Bush has already told his advisors to make sure Conda-poo-poo schedules her upcoming trip to Israel for the Sunday after he leaves, just in case he doesn’t get to it. If there are any changes I will of course update you with up to the minute news. I started reading expecting to find about road closings etc and ended up on the floor laughing! Well there is plenty more what that came from so keep up your blog reading! Good post Molly. I wonder where a late-night coke run will fit in for the Secret Service? A 60,000 NIS plate of Bush-face hummus? I love it. "The Schedule for President Bush’s Visit to the Homeland" was written January 4th, 2008	by thebigfelafel, and filed under If I ran Israel, Jerusalem Scene and tagged Abu Mazen, America, annapolis, Askelon, Gaza, Israel, jerusalem, Livni, Olmert, Peace Talk, Posts by Molly, President Bush, road map, schedule, Sderot, trip, US, visit.